Today we tell you the story of a real magical wedding: that of Lucia and Alessandro, in a fairy-tale location, Tenuta Monacelli. “The wedding of my best friends” Lucia, or wedding supervisor, tells us, “has been such a moving and unique event, in which the elements of nature, earth, fire and wind have dressed for the occasion, to frame their love story. Every image is a tale of a fragment of shared joy. 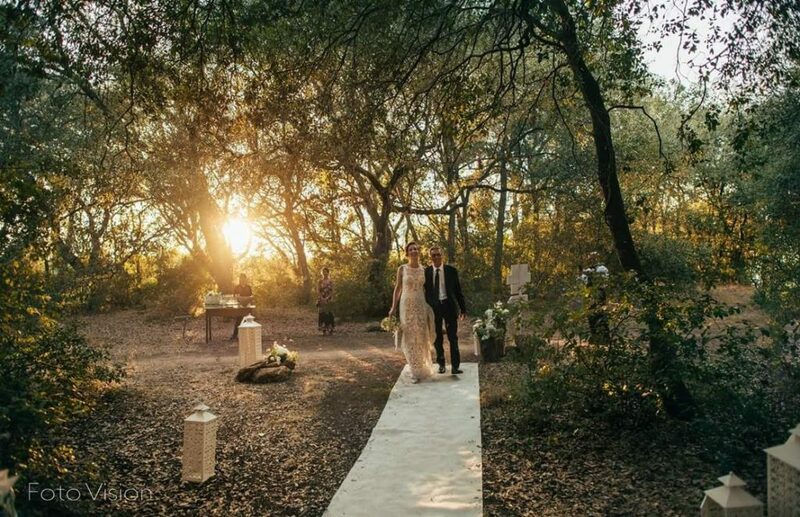 The first step is the enchanting scenario in the woods of Tenuta Monacelli, the ideal background for the symbolic civil rites that the structure proposes to the couples. Enveloped by the magical vibrations of nature, Alessandro and Lucia let themselves be captured by the eye of the photographer, while the sunrays at sunset play with the vegetation and embrace them in a halo of light. An unmissable rite to fix those special moments, before entering the location. Awaited by the guests and acclaimed with an applause, the arrival at court of the wedding couple, made fresh and original by the musical backdrop of the cheerful street band Bedixie, and the evanescent shower of petals that a couple of Itinerant Waders let fall as they pass by the magnificent entrance. The typical court of the XV century, the ancient stone paving that holds the signs of the passing of carriages and wagons, welcomes the couple and frames the welcoming appetizer, giving to it a peculiar charm marked by elegance, tradition and intimacy. To encourage the exquisite taste and enhance the conviviality there is the appealing fusion of ancient and modern perfumes: the intoxicating one of the earth at night mixed with the unmistakable aroma of the food, with the music in the background and with the joyful conversations, in an original combination. 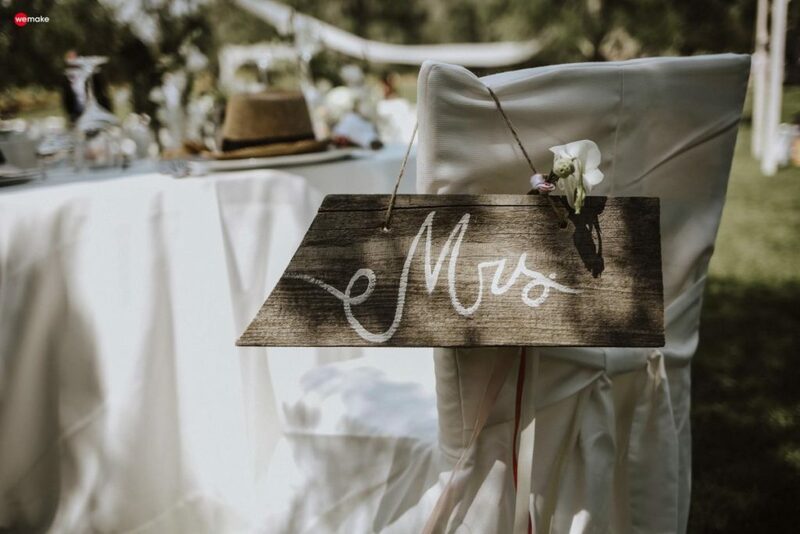 A toast to the couple’s happiness before going inside for the wedding dinner in the secular olive grove, welcomed by an original tableau de mariage, personalized for the occasion with the symbols of typography and of writing: an old typewriter, big clichés, drawers of characters. And then the dinner under the starred sky, in this enchanting scenery, an impressive table, just perfect to accommodate all the guests, that remind of the traditional British country festivities. The tables, each one signed with the name of a specific typeface: Nebiolo, Elzeviro Bodoni, English Cursive, Bembo, Monothype, are masterfully prepared on the wide meadow, surrounded by the natural sculptures of the secular olive trees, embellished by country chairs and by the magical touch of the delicate, elegant floral composition by Rollo fiori; with white and green tones and with clouds of light mist that enhance the candor of the tablecloths and a mise en place both refined and sweetly rural. A scenario that delights the guests, charmed by the tricks of the light among the trees, by the engaging interludes of the street artists that attract both adults and children, by the sudden speeches of friends, and by the soundtrack that with music and singing goes from modern to classical. People dance to the beat of music and of pizzica, played by the talented Cunservamara with Cristina Frassanito that communicates lightness and dynamism. 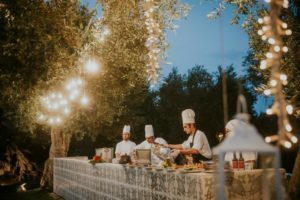 All of it adds value to the wedding dinner under the stars that is honoured by the exquisite cuisine of the chef Andrea Serravezza. The conviviality moment closes a suggestive fire spectacle that enchants and attracts the gazes. It is the solemn moment of the wedding cake’s cut. Expert hands have moulded a spectacular Wedding cake, a blaze of goodness and whipped cream architecture with fondant that comes into play in the space surrounding the pool, embraced by the secular olive trees, also stage of the artists’ performance that move with plastic elegance in the transparency of huge bubbles on the surface of the water: an image of breath-taking beauty. Original sweet architecture and a variety of Jordan almonds complete the romantic atmosphere, marked by the trumpet solo on the notes of “Something over the rainbow”, acclaimed with excitement by the public. As a final touch, the staging of a moment dedicated to the goodbye of the couple that thank the guests giving them a token to remember their magical day. 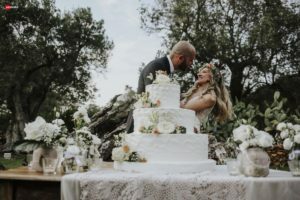 The favours consist in a jar of honey, artisanally produced and offered in a little pouch with a teaspoon: a choice in line with the location and the style of the ceremony. How to describe the emotions of this special day? Words fail me, they are incapable of expressing the vibrations of the heart.